Last night I was checking the BBC site when I saw that Jane Wyman, one of Hollywood's biggest stars of the 1940s and '50s and the first wife of former US President Ronald Reagan, had died aged 93 and I was going to write about her, but then another headline caught my eye: "Body Shop founder Roddick dies". I was stunned at the news that Dame Anita Roddick, the founder of the Body Shop, had died from a brain haemorrhage aged 64. Anita Roddick and I share the fact that we were both born and raised in West Sussex, a county on the south coast of England, making her something of a local hero among everybody in the region. She was born in Littlehampton, a seaside resort close to where I went to primary school, I have driven passed The Body Shop headquarters many times and she eventually died in St. Richards Hospital in Chichester, the place of my birth. As strange as it may sound, but wherever I see The Body Shop store across the world, including the ones in Helsinki, it always reminds me of home and also some of the countless Christmas and birthday gifts that have been bought for Mum over my teenage years. 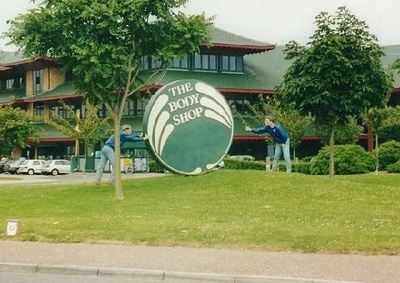 The Body Shop headquarters based near Littlehampton are located just off a large roundabout and have been the cause of many crashes due to the stunning Chinese style architecture and also the two-full size men that appear to be positioning the large Body Shop logo on its front lawn (see photo). The Body Shop's success story is one that never fails to impress with its humble beginnings in March 1976 when Anita Roddick opened a small store in Brighton. Despite complaints from the neighbouring undertaker about the name and the fact that its famous green colour originated because, as Anita says, "It was the only colour that we could find to cover the damp, mouldy walls of my first shop." The creation of The Body Shop occurred just as Europe was beginning its first Green crusade, although the real reason Anita Roddick opened a shop was simply to create a livelihood for herself and her two daughters, while her husband, Gordon, was away. "I had no training or experience and my only business acumen was Gordon’s advice to take sales of £300 a week. Nobody talks of entrepreneurship as survival, but that's exactly what it is and what nurtures creative thinking." Her creative thinking blossomed into The Body Shop International plc, which now has over 2,000 stores in more than 50 countries. Last year, The Body Shop agreed to a £652.3 million takeover by L'Oreal that would give Anita and Gordon Roddick £130 million from the sale and ensured that Anita would among the UK's richest women. However, in recent years it has been her tireless work for good causes that has brought her considerable attention. The last post made on her personal blog www.anitaroddick.com a few days before her death was bringing attention to Amnesty International Secretariat's statement on the Angola Three, which calls for Robert King Wilkerson, Albert Woodfox and Herman Wallace be freed from solitary and their cases re-examined for misconduct by the state. This campaign had become one of her greatest passions, with her writing on her blog; "It is my intention to do whatever it takes, for as long as it takes, to see that their story is told and they are set free." Her death is a tragic loss to countless good causes across the world who benefited from a prominent vocal figurehead bringing much-needed attention to issues and the suddenness of her death truly hits home when you read the final paragraph of her 'About Me' page: "With The Body Shop and Anita Roddick Publications, I will continue fighting for human rights and against economic initiatives and structures that abuse and ignore them. That’s a tall enough order to keep me busy for the next 30 years." I hope there will be somebody brave enough to pick up the torch laid to rest by Anita Roddick because West Sussex's environmental entrepreneur was one of a kind. Thanks for all the Christmas present ideas, Anita!